Design Junkies: New Technique Junkies Challenge - Hot Colors! New Technique Junkies Challenge - Hot Colors! Today is the start of a new challenge! Let's make some projects using Technique Junkies Stamps in hot (warm) colors! list at the bottom of the post for a chance to win a $25 Technique Junkies Gift Certificate! You have until October 14th to enter. Winner will be announced October 15th. You must use Technique Junkies stamps to be chosen to win a prize. your project but you will not be in the drawing for a prize. No linking old projects. Projects must be new. Please list Technique Junkies stamps with links in your project posts. Please link directly to your project (not a general blog). Want a discount? 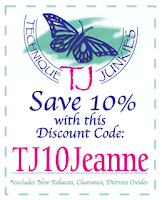 Use code TJ10Jeanne for 10% off at Technique Junkies! 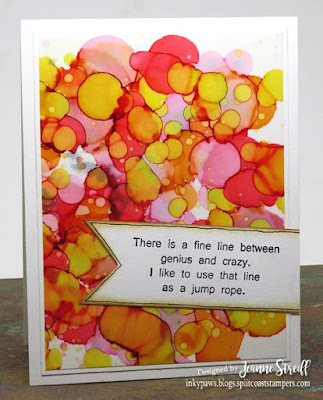 My card uses Genius and Crazy on an alcohol ink background. Wow, Jeanne! That background is terrific! Such a fun challenge, and I love your alcohol ink background!! ATC's That Shine Challenge Winner!